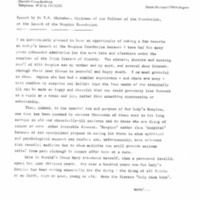 A copy of a speech delivered by T.K. Whitaker, chairman of the fellows of the foundation, at the launch of the Irish Hospice Foundation on 21 April 1986. T.K. Whitaker, “Speech by T.K. Whitaker at IHF launch,” Archives Hospice Foundation, accessed April 21, 2019, http://archives.hospicefoundation.ie/document/22.